Everyone has their favourite things to cook. The recipes that just work and you can do with your eyes shut. The no-fails you can rely on at the last minute. So when I was reading this month’s Delicious magazine and came across a photo of a beautifully decorated chocolate cake, I would never have thought that this recipe would become one of those on repeat. Primarily due to the ingredient list which are not your stock standard pantry staples with chocolate halva and pomegranate seeds on the list. But when the reaction after the first go and serving it up was silence, then seconds and even some people requesting thirds and no leftovers; all I could do was smile. It was the beautiful photo that sealed the deal although it also initially met my other criteria in needing to be gluten-free. Sourcing the ingredients list sent me on a goose chase around Sydney finding chocolate halva at Russkis deli in Bondi and edible rose petals at Herbies in Rozelle and with Mr ELG and BIT sent out for a morning walk, the oven preheated to 170 degrees, the mix was surprisingly easy to whip up and bang together. With a Kitchenaid this recipe is a one-bowl wonder – love that! As it baked in the oven I admit that I wasn’t too sure how it would turn out….too dry, too sweet, not sweet enough?! And after it emerged out of the oven, it definitely did not look like its photo just yet. More like a Cinderella waiting for the fairy godmother to swing on by to wave some magic. 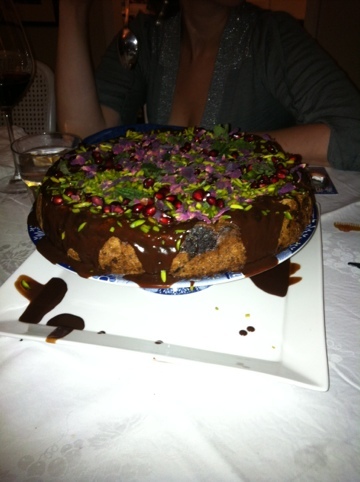 But with the magic of chocolate sauce, freshly torn mint leaves, scattered edible rose petals and pomegranate seeds; this TURKISH TORTE was the belle of the ball. 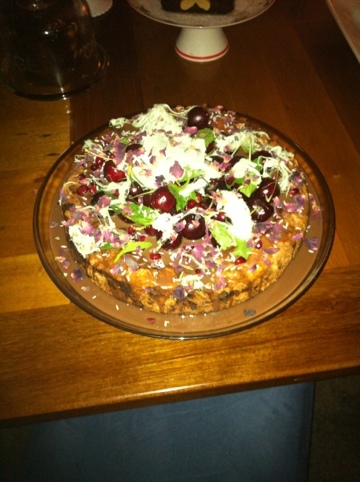 I cooked the Turkish Torte for Christmas and dressed it with cherries and Pariya Pashmak green pistachio fairy floss as well to give it an extra festive kick. And as I go to cook this recipe the third time this month (this time it’s a birthday cake), I am smiling again as I remember driving home with Mr ELG after eating the cake for the first time. We were chatting as you do, breaking down the night with our in-the-car analysis and when I asked what he thought of dessert, one word came out of his mouth. Humdinger! ” Humdinger!” I cried?!! “Yes, humdinger” he repeated, “the best ever chocolate cake”. It was my turn to smile and think I love you Mr ELG!